Absorbing, inspiring and politically provocative, this is an enjoyable, well made fly on the wall documentary about a fascinating and deeply relevant contemporary figure. 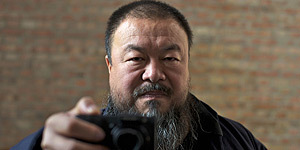 Directed by Alison Klayman, Ai Weiwei: Never Sorry is a fly on the wall documentary about Chinese contemporary artist Ai Weiwei. Granted impressive access, Klayman's cameras follow Ai Weiwei over the course of three years as he prepares for shows in Munich and London (the famous Sunflower Seeds installation in the Turbine Hall of the Tate Modern) and engages in political activism in his own country, chiefly through his crowd-sourced project to publicly list the names of all the victims of the 2008 earthquake in Sichuan. Along the way, Ai undergoes various encounters with state forces, ranging from a terrifying assault while police were attempting to prevent him from testifying at the trial of fellow activist Tan Zuoren (Ai later films himself officially filing a complaint) to the more comical sight of Ai filming police as they film him eating dinner with friends at a restaurant. The Chinese government also unwittingly provides Klayman with a suitably chilling ending, as Ai is imprisoned and held for 81 days, ostensibly over tax evasion. He emerges clearly shaken from his ordeal, no longer able to give interviews, leave Beijing or use social media, though a caption informs us that he is now back on Twitter. Klayman paints a comprehensive picture of Ai Weiwei's life and work, touching on his childhood, the artistic influences of both his dissident father (the poet and political prisoner Ai Qing) and the decade Ai spent in New York between 1983 and 1993, aged 26 to 36. She also includes illuminating talking-head interviews with friends, family members, colleagues, fans, critics and young people involved in his ongoing earthquake project, while cataloguing his most famous works such as designing the Bird's Nest Stadium in Beijing before publicly criticising the staging of the Olympics, being photographed breaking an antique vase and so on. What becomes clear is that the personal and the political are inseparable within both Ai's work and his life; at one point he describes himself as a chess player waiting for his opponent to make the next move and it's fascinating and occasionally funny to see his responses to his ongoing oppression. For example, when police position CCTV cameras around his studio, he retaliates by making marble statue CCTV cameras. The film also makes intriguing use of Twitter, highlighting its invaluable use as a communication and distribution tool for Ai's work. Klayman includes several of Ai's tweets, the most amusing of which is “There is no outdoor sport as graceful as throwing stones at a dictatorship”. If there's a flaw in the film it's only that Klayman refuses to delve too deeply into Ai's obviously complex personal life, which sounds fascinating in itself. This is an engaging, well made and important documentary that is well worth seeking out. Highly recommended.